For your clients ages 6+, this DIY business card holder could be the ideal gift! Yes, it’s that time of year again – the double-edged holiday season. We encourage each other to do good corporate deeds from a giving perspective, but let’s be honest: people enjoy receiving presents. And perhaps, your budget is large enough to allow you to simultaneously donate to a worthy nonprofit and dispense client/customer expressions of affection. This One Is so Uncommonly Good, You’ll Bookmark and Use It Regularly: Let me kvell for a moment by saying that the people responsible for Uncommon Goods LLC had me at Mobile Foodie Survival Kit. You will not believe the creativity available in gift form, for $25 or less, via this website! Your IT, Digital, and Other Clients Will Remember the ThinkGeek Gift You Send: The offerings at ThinkGeek.com target a more technical niche and are perfect for your clients who swipe, text, and post all things digital. You will enjoy exploring the site for nerdy science toys as well as licensed/themed gifts: Star Wars, Doctor Who, Star Trek, Minecraft, The Big Bang Theory, and more. Oh dear, perhaps your budget doesn’t stretch far enough to send a LEGO Desk Business Card Holder to each client or customer. Well then, if you have a child in the home who builds with LEGO blocks, you’re in luck. For a small fee (e.g., perhaps a long-desired, reasonably priced LEGO set for Christmas? ), ask your clever kid to create custom business card holders as this year’s corporate gift. Before shipping those bursts of built creativity on their way, be sure to sticker them with your company logo. My son started building business card holders out of LEGO blocks when he was 8 years old, but he’s moved on to other projects (like this year’s Hanukkah present – the Tower Bridge set – all 4,295 pieces of it) since then. Swing on the Monkey Bars at the Office Playground: This website claims to offer the “World’s Best Selection of Office Toys,” and I’m likely to believe it. How can you go wrong with an executive/office/desk toy company offering baubles for under $2 (each) that won’t spoil or perish in transit? One item that really caught my attention was the (femur) bone pen on the “Top Sellers” page. Peruse this entertaining site if you’re still on the hunt for client gifts. Just be sure to check out the assorted Galileo Thermometers before you go. Do you have one of these? I sure don’t. Yes, it’s a bit more costly than other tchotchkes, but I doubt your best clients will receive anything else like it before 2013 comes to a screeching halt. If you’ve already selected a holiday gift for your client/customer base, what did you select and why? Do you gravitate toward digestible corporate gifts, or are any of my non-edible suggestions actually setting off an alarm inside your head? We’re all friends here, so please leave a helpful website or gift recommendation before your eyeballs wander elsewhere. Merry business gift shopping – happy corporate trails to you! 2 Responses to The Most Unique and Unusual Business Holiday Gifts Ever! 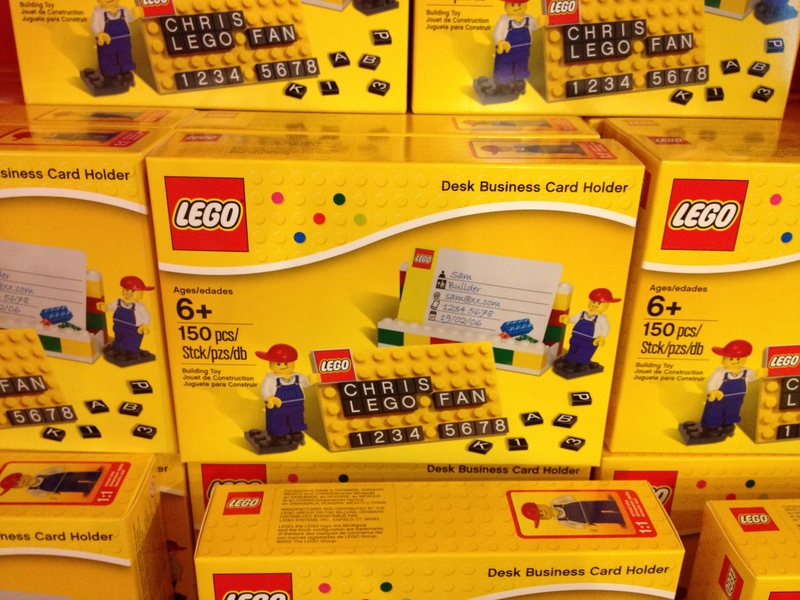 Love the LEGO business card holder, if course, I’m not surprised by your discovery. Thanks for stopping by! Yes, the LEGO business card holder is a must if you have a LEGO junior “master builder” in the home. Talk/see you soon in 2014 :-).